Location: East side of Marmion Road. Parry Court and Len Maynard Court occupy the station site while Porters Walk occupies the site of the goods yard. Beyond that, the cutting to the south portal of Thorneywood tunnel is extant but with no apparent point of access.. Present state: Demolished with exception of Station House located on Porchester Road/ The retaining wall to the north of the station site on the east side also remains. Notes: Thorneywood station was located in a deep cutting on the west side of Porchester Road, immediately south of the 408yd Thorneywood tunnel. The eastern side of the cutting was strengthened by a blue brick retaining wall which was spanned by a wrought iron lattice footbridge which connected Porchester Road (at that time called Thorneywood Lane) and Marmion Road. It was in this area that the station yard and goods shed were located. 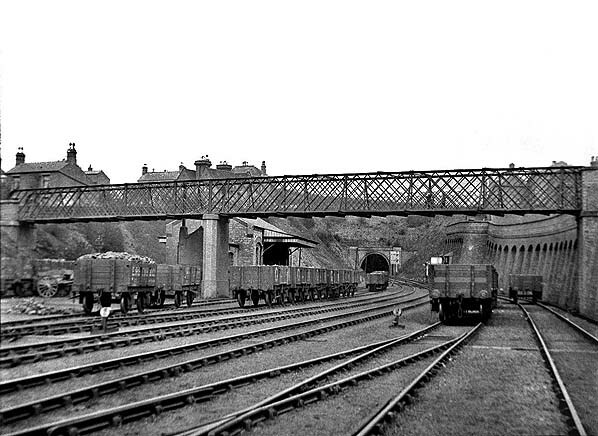 The goods yard was the busiest on the line and handled a full range of traffic including livestock, with a cattle dock being provided behind the north end of the up platform. In the early years there were four coal merchants operating from the yard; three of them were still there in 1930. The yard comprised two loop sidings, one passing under the canopy of a large brick goods shed. A third siding hugged the western perimeter of the yard. There were further sidings on the up side of the line with a short headshunt behind the platform giving access to a rope-worked incline running through a tunnel under Thorneywood Lane into the Thorneywood Brickworks of the Nottingham Patent Brick Company. To the south of the station, on the down side, another short branch served the Nottingham Builders' Brick Company works. 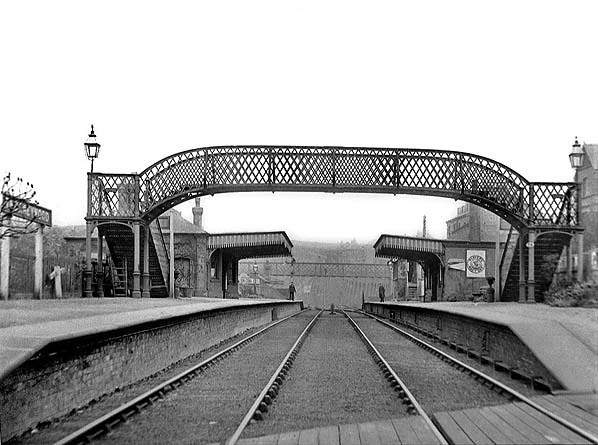 The approach to the station was from the western side of Marmion Road, and the station itself consisted of two 360ft facing platforms connected by a wrought iron lattice bridge standing on cast iron columns. The single-storey brick booking office was located on the down side with a brick waiting room on the up platform. Thorneywood had two signal boxes; there was a 30-lever box at the north end of the up platform with a smaller 10-lever signal box at the north end of the yard on the up side; this was manned only when required for shunting. Both platforms’ buildings had wooden awnings supported by ornamental brackets. The stationmaster's house was in Thorneywood Lane overlooking the station. Wooden steps led down from the house to the platform at the rear of the signal box. Both the house and the station buildings were designed by TC Hine. Immediately to the south of the station a bridge spanned the railway taking Carlton Road over the line. The station was initially well patronised, but the arrival of the Great Central Railway in 1899 provided commuters with a more direct route into Nottingham city centre, and the electric tramcar which reached Thorneywood in December 1910, also hit passenger services hard. As a result, the station was closed to regular passenger services on 1 July 1916. It has been said that during WW1 wounded soldiers arrived at Thorneywood by special trains from where they were transported to local hospitals. After closure the station fell into disrepair; however both Thorneywood and Sherwood were renovated for a single event on 10 July 1928 for the purpose of transporting schoolchildren to nearby Woodthorpe Park where King George V and Queen Mary were to review the gathering between their visits to Wollaton Park and the new university buildings. After singling of the line in 1930 the canopies at the station were removed. Further clearance started on 8 April 1938 when the signal box and waiting room on the up platform were demolished along with the booking office and part of the waiting room on the down platform. The line was used between Thorneywood and Daybrook for a thrice-weekly goods service until this was withdrawn on 1 August 1951. The track had been lifted and the remaining station buildings demolished by 1954. 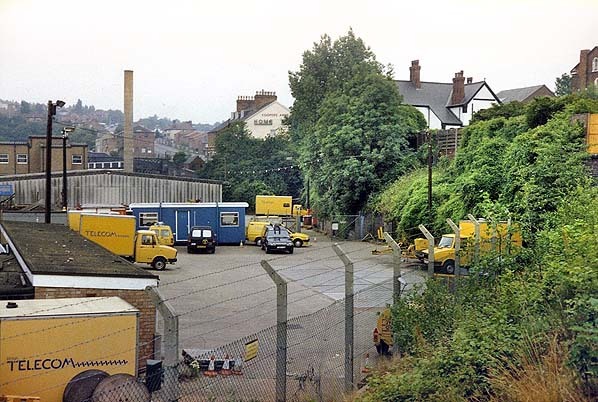 The station site was acquired by British Telecom who built an engineering depot utilising virtually all the trackbed between Carlton Road and the south portal of Thorneywood Tunnel. This depot was demolished in 1999 and the bridge spanning the cutting removed. 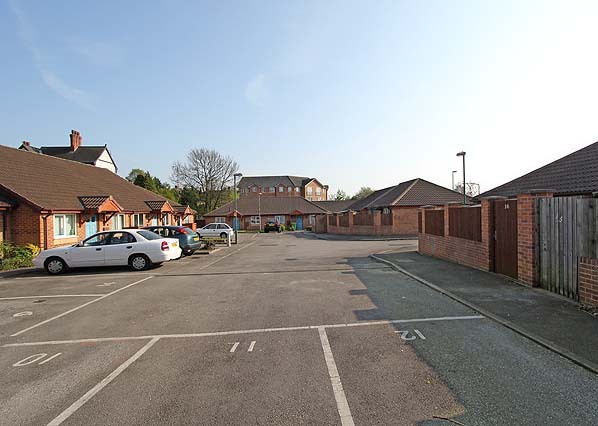 By 2000 the station site had been further redeveloped with a sheltered housing complex. Ticket from Michael Stewart. Bradshaw from Chris Totty. Route map drawn by Alan Young. Thorneywood station looking north from the barrow crossing c1904. The main station building is on the left with a waiting room on the down platform. The signal box is seen on the up platform just north of the waiting room. The lattice bridge spanning the line in the middle distance linked Marmion Road and Porchester Road which ran parallel with the line on either side. The goods shed is seen beyond the bridge on the left with the retaining wall on the right. The stationmaster's house is seen on top of the cutting on the right. 1912 1:2,500 OS map shows the layout of the station and goods yard. The station fronts directly onto Marmion Road. There are facing buildings on the two platforms with a footbridge spanning the line to the south. To the north, a public footbridge spans the cutting linking Marmion Road and Thorneywood Lane . The goods yard is on the down side to the north of the station with its entrance off Marmion Road just north of the station building. The yard comprises two loops, one passing under the canopy of a large goods shed. From these a short siding runs behind the north end of the down platform where there is a cattle dock. A weighbridge and office are seen just inside the entrance to the yard. The small building to the south of the main station building is a lamp room. An additional siding entered from the north loops around the western perimeter of the yard. There is also a loop on the up side; from this a rope-worked incline runs through a short tunnel under Thorneywood Lane and on to the Thorneywood Brickworks. All traffic movements around the station are controlled from two signal boxes: one is on the up platform just north of the waiting room, and the other is to the north of the goods yard on the up side. The stationmaster's house is the second (L-shaped) building along Thorneywood Lane on the left. The next building north is the Cooper's Arms public house. Click here to see a larger version. 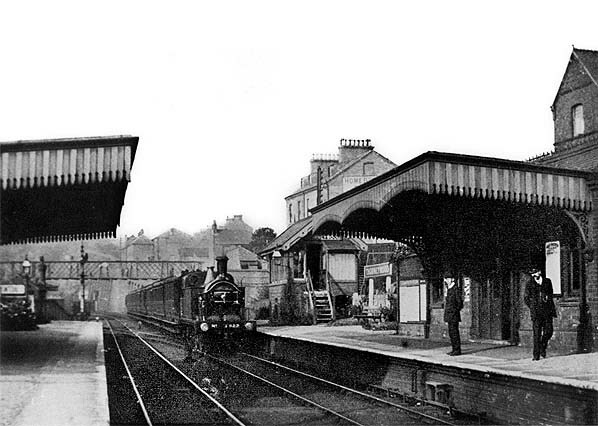 Looking north at the Carlton Road bridge and Thorneywood station in 1904. 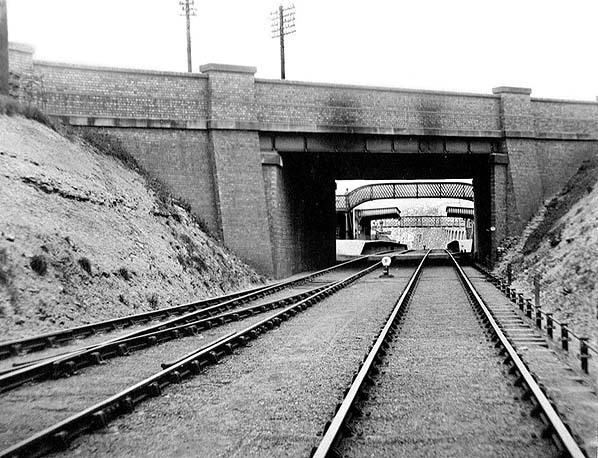 The trailing junction on the left is the line serving the Nottingham Builders' Brick Company works which was partially on top of Sneinton Tunnel. the foreground on the right. The stationmaster, Leo Faunthorpe, stands on the platform at Thorneywood awaiting the arrival of a southbound train hauled by a GNR Stirling R Class No.822 in 1911. The station signal box is seen on the platform. There was a second box close to the entrance to the goods yard on the up side. The lattice footbridge in the background links Marmion Road with Porchester road and avoids a long walk round the south end of the station. 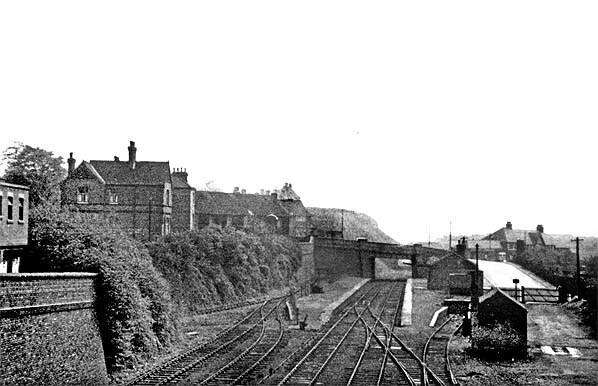 The two buildings on top of the cutting are the Cooper's Arms pub in the centre and the stationmaster's house on the right. 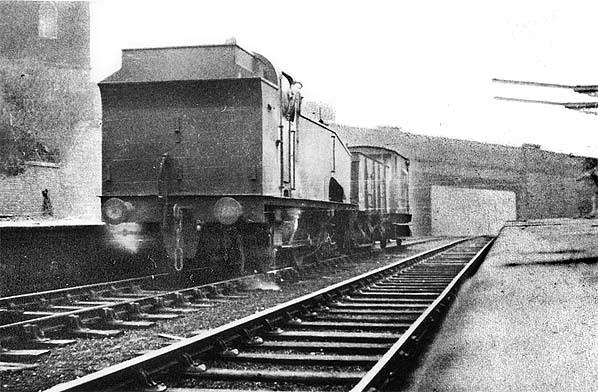 An unidentified 0-6-0 J50 hauls a freight train through the closed Thorneywood station c late 1920s. Carlton Road bridge is seen in the background. The supports from the demolished down platform canopy are seen on the right. Enthusiasts gather on the platform at Thorneywood on 16 June 1951. The last passenger train to use the station was the RCTS (East Midlands branch) Nottingham railtour which was a round trip to Heanor from Nottingham Victoria via Daybrook, Bulwell Common and Ilkeston. 67363 is an ex-GNR Ivatt 4-4-2T, built at Doncaster works in April 1900 and later fitted for push-and-pull working. It survived until 30 November 1958 when it was withdrawn from New England shed and sent to Doncaster for cutting up. Thorneywood station looking north in May 1952, eight months after complete closure of the line. All of the up platform buildings have been demolished. Part of the down platform building is intact although it lost its canopy many years earlier. 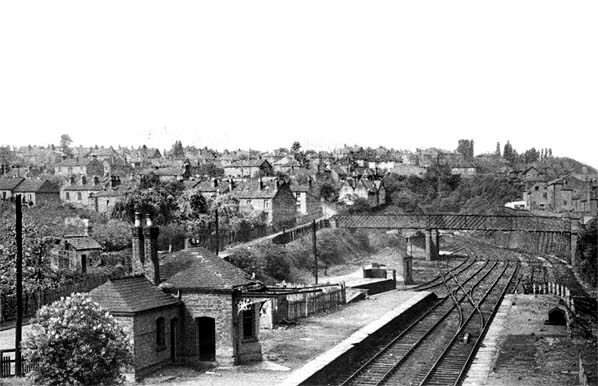 Thorneywood station looking south from the pubic footbridge in May 1952. The entrance to the goods yard is seen on the right with the weighbridge and weigh office just inside the yard entrance. A short siding serves the cattle dock at the rear of the north end of the down platform. All the buildings on the up platform were demolished in April 1938. The sidings on the left served the incline to the Thorneywood Brickworks of the Nottingham Patent Brick Company. The short headshunt behind the up platform allowed only a small number of wagons to be hauled along the incline at one time. The bottom of the incline can be seen coming in from the left; the tunnel portal is behind the retaining wall on the left. 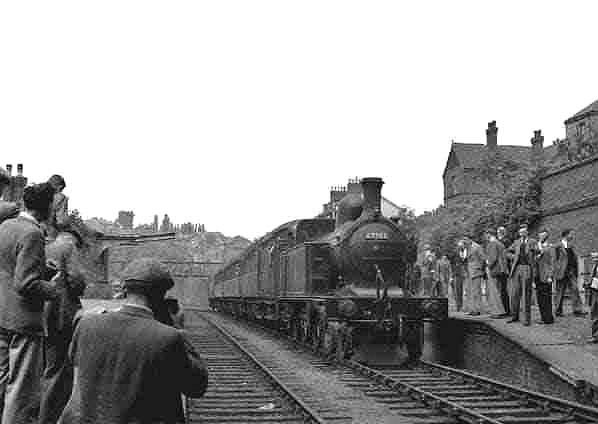 Thorneywood station looking north from the passenger footbridge in May 1952. The booking office was partially demolished in April 1938. The cattle dock is seen behind the north end of the up platform. 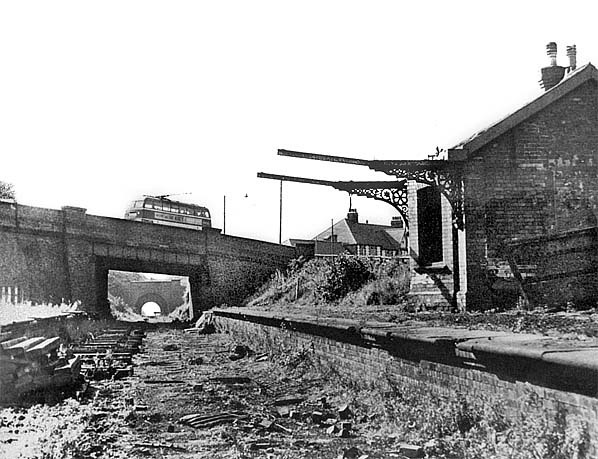 Thorneywood station looking south during track-lifting c1963. Sneinton Tunnel is seen on the south side of Carlton Road. Note the trolley bus on the bridge on the 39 route, one of eight routes in the city. The 39 ran between Post Office Square Carlton and Crown Island, Ilkeston Road, Motor buses replaced trolley buses in 1965; the last trolley buses were withdrawn on 30 June 1966. Six Nottingham trolley buses are preserved, four of them at the Trolleybus Museum at Sandtoft, Lincolnshirethe. 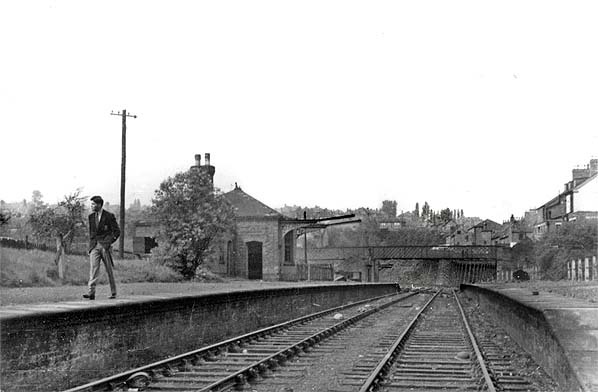 Looking south at Thorneywood station site c1970. 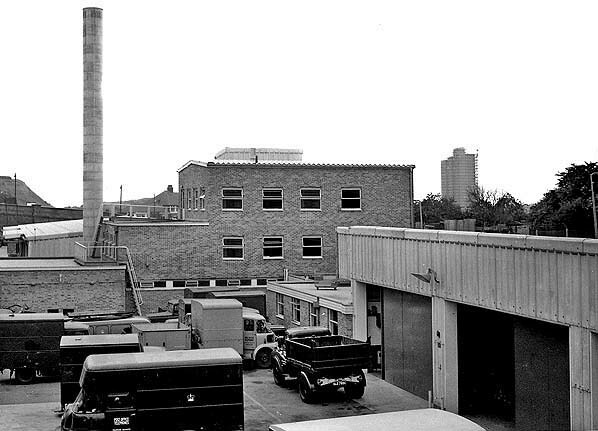 A GPO engineering centre was built on the site c1960s. The Carlton Road bridge is seen in the background to the left of the chimney. Looking north at the site of Thorneywood station from Carlton Road in the mid 1990s. 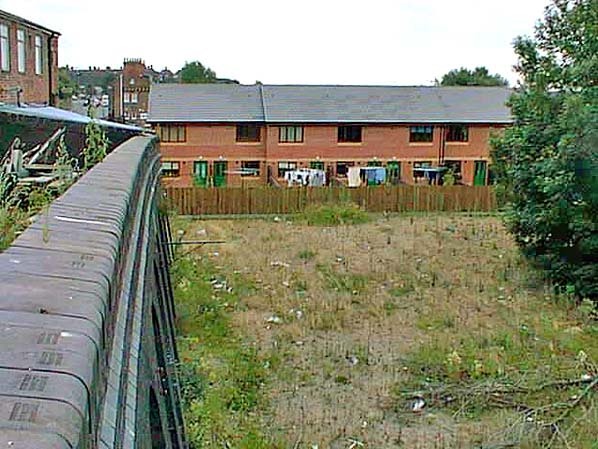 Looking north towards the site of Thorneywood station from the public footbridge in 2000. The GPO depot closed in 1999 and was quickly demolished and replaced with the sheltered housing seen here. Looking south along Len Maynard Court at the site of Thorneywood station in April 2011. The stationmaster's house is seen above the houses on the left.